The 10 Best CrossFit Gyms in West Virginia! The physical exhilaration found at a CrossFit gym creates a truly unique experience. Combining weightlifting with gymnastics, calisthenics, and more, it’s the ultimate recipe for getting fit. And it doesn’t matter if you’ve never tried it before, these CrossFit gyms in West Virginia are made for novices and experts alike. Here are the 10 best in the state. Strong Tower Fitness in Parkersburg, West Virginia, has the goal to inspire and motivate people to be the best they can be. Onsite and offsite programs are available and led by certified trainers who can help your team reach their goals quickly and effectively. There are various membership plans to work within your budget, and the family atmosphere makes it a popular place. Whether you’re looking for group classes, nutrition help, weight training, or personal growth, this faith-based CrossFit gym can help you grow physically, mentally, and spiritually. Specializing in fitness training for individuals, CrossFit Huntington has professional trainers who listen to you and work with you to establish attainable goals that focus on safety and strengthening your core. Workouts combine several basic elements from various sports like track, gymnastics, weightlifting, and other core-building activities designed to give your body a workout. Established in 2014, CrossFit Esprit is located in Ronceverte, West Virginia. Embracing the belief that everyone, no matter where they are in ability, can benefit from the same type of workout if they follow the guided routines faithfully. By using workout techniques from a variety of sports, a regime can be established that strengthens the entire body, not just a specialized group of muscles or area. A strong core is the basis of this workout program, and middle school students all the way to senior citizens are welcome to enroll in one of the classes. Use of equipment is also included. Serving the Fayette County area since 2009, New River Gorge CrossFit in Fayetteville, West Virginia, offers a free introductory session designed to let you meet and talk to trainers who will help establish your goals and get you on the path to better fitness. This special one-on-one interactive course is designed to get you transitioned into the group workouts. One-year memberships with discount incentives and month-to-month plans that can be cancelled at any time are available to fit any budget. AFC CrossFit in Oak Hill, West Virginia, is a high-intensity strength training program designed to improve your overall health and fitness by using multiple sports disciplines. This variety improves endurance and stamina, builds strength, power, and speed, encourages flexibility, and creates better balance and coordination. AFC CrossFit has a 1,000-square-foot aerobics room with cushioned floor that provides a safe workout environment for beginners to skilled athletes. There’s a Kids Korner and a Silver Sneakers program so no one has a reason to not be in the best health and shape possible. With a beautiful 18,000-square-foot facility and dedicated coaches who can help you design your fitness plan, Revved Up CrossFit in Hurricane, West Virginia is a great place to work out with others who value their health and well-being. 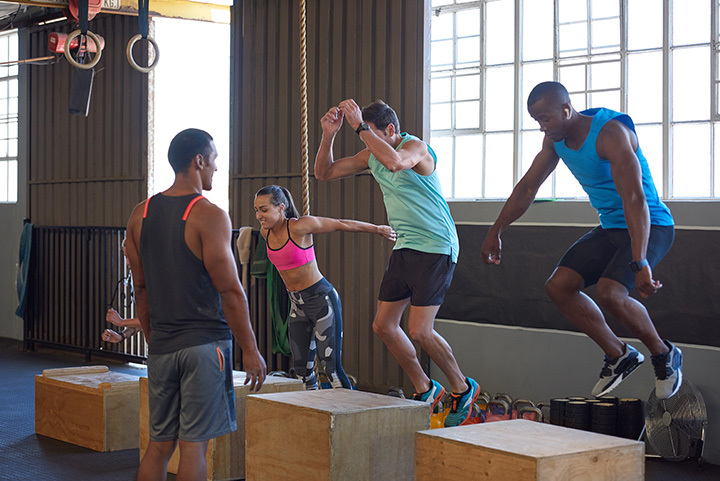 No matter what your personal goal is, weight loss, building strength and endurance, or just feeling better and more balanced, Revved Up CrossFit can help you reach your potential. Trained professional take the guesswork out of training and teach you in a group setting using methods from a variety of sports practices. Using the P.L.U.S. System (Position, Load, Utilization, Specificity), trainers will help you avoid common injuries by teaching you how to work with your body. Group workouts are a great way build friendship and support one another in the journey toward good health. CrossFit Ridgeline, located in two convenient locations, Morgantown and Suncrest, West Virginia, wants to be the place where you reach your fitness goals. Providing a supportive environment, comprehensive workouts, and nutritional information, there are also programs that teach you how to challenge yourself to reach your goals. The coaches and supportive community help you keep going when you don’t think you can. Payment plans are available that are easy on your wallet. Firebreather Fitness opened its doors in 2009 in Scott Depot, West Virginia, with the goal of offering personal instruction and encouragement for people who want to improve their health and fitness. There is no requirement that you are an athlete, and the training is individually designed but done in a group environment where participants can encourage each other. The CrossFit community at Firebreather Fitness is there to help you reach your goals and the professional trainers can answer your questions about the workout program, nutrition, and other concerns you may have. Functional workouts, fitness, and fun. That’s what 1201 CrossFit in Elkins, West Virginia, emphasizes. Using techniques from a variety of sports disciplines and adding everyday movement, high-energy workouts, and strength conditioning, you can improve your physical fitness no matter where you are currently in your ability. Open every day except Sunday, you can join other likeminded people for group workouts that will challenge you, but in a supportive environment. Call for a free introductory session and meet the coaches who can help you reach your goals. Do you want to be the best you can be? Are you unsure how to do that? Stop by CrossFit Iron Fury in Beckley, West Virginia, and talk to one of the friendly professional coaches who can answer your questions. With the goal of helping your reach your greatest potential in all areas of life, CrossFit Iron Fury trainers want to challenge and encourage you not to settle for less than you’re worth. With a variety of classes for many interests, the gym is open Monday through Saturday and by appointment. Childcare is available, and a Kids Fit program is coming in the near future.